**PROUDLY MADE ENTIRELY IN THE USA **SUPERIOR CONSTRUCTION using Finished and Sealed Solid Hardwood Legs and Solid Hardwood Side Frames which gives added Safety and Protection for the play surface. **Built-in Heavy Duty Mesh Storage Bags(patent) to retain building blocks safely within the table rather than be scattered all the floor like other table designs. **PREASSEMBLED so only the legs need to be fastened into the table frame. Encourage your children's imagination and manipulative skills. **Building Blocks not included with the table. **OPTIONAL PLAY COVER AVAILABLE TO CONVERT TO A PLAY OR GAME TABLE. 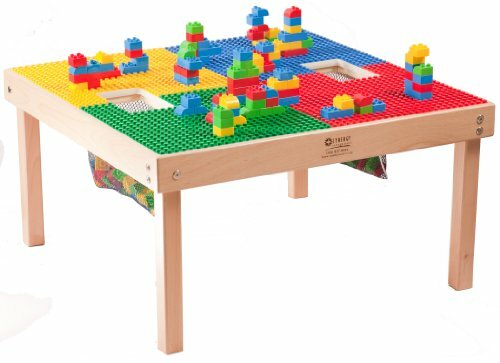 ORDER #TC32 FUN BUILDER COVER Fun Builder Cover **"AGES 1 TO 5"
Two (2) Built-in Sturdy Mesh Block Storage Bags(patent) keeps blocks contained within the table and not on the floor! Dimensions: 32"L x 32"W x 18"H MADE IN USA!! If you have any questions about this product by Fun Builder, contact us by completing and submitting the form below. If you are looking for a specif part number, please include it with your message.